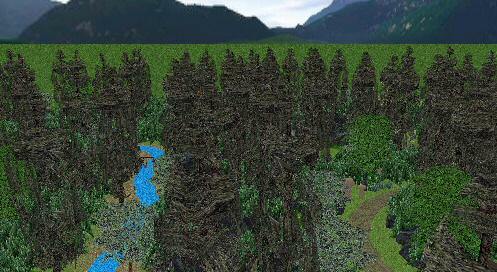 K'iin Woods (pronounced "Key-in") is a mid-sized forest in the central portion of SW Island in Syntax Estates. Over the years, it has grown from a relatively low-height forest to a towering forest containing mostly Kithicor Pines and heavy underbrush consisting of mostly Halo Bushes. The forest itself contains a very old network of trails and pathways that take visitors on a tour through an area around a small pond with a couple cabins along its shoreline. K'iin Woods is also home to the Sun Temple, an ancient pyramid of unknown origin.